I'm thrilled!! Our new website for Re-Covered Treasures is now up and running! HOORAY!! Thanks to everyone for their patience during the transition!! Due to the popularity of my previous post about Mardi Gras Masks, I have decided to make a couple more butterfly-based masks out of recycled paper (which I am planning to put up sale soon at my Etsy store GiftBaskets4Fun). I found the cardboard for this project in packages of other papers. The cardboard is stiff but relatively thin so it can be cut relatively easily with scissors. First, I had to make a new template (because in my infinite wisdom, I didn't save the previous one!). In order to have both sides of the butterfly be the same, I only drew 1/2 of the butterfly and the folded the paper and cut it out while folded...that gave me a perfect mirror image on both sides of the butterfly. Next, I traced the butterfly onto the cardboard and then cut it out with scissors. I used my mid-quality scissors to cut out the main butterfly shape and used my good-quality scissors and my x-acto knife only for the detail-work (so as to not do damage or dull the blades). I find that I am motivated by trying to use as much of my base-product items as possible when I craft. So this time, I took eye-hole cut-outs and used them to cut out a bunch more of the same shape from the left-over cardboard chunks. I ended up with a total of 21 eye-shapes which I believe make wonderful feather-shapes (see my previous post about Mardi Gras Masks - and look at the owl). Once I had cut out all of the eye/feathers, I ended up with very little cardboard leftover (and a much better option for adding to my recycle bin - or perhaps I will keep the bits and see what they add to my hand-made paper). Cutting out the mask-shape from the cardboard is really the hardest part. The rest is just fun. I like to paint the whole mask a base-color and then dry-brush another color over the top to give it a more feather-like feel. I may also experiment with paint-scrapping to get a different feel. I love this project because anyone can easily decorate and personalize the masks. It's a fun way to introduce the concept of collage. I love that my daughter is excited to make her own. We may play with other mask-shapes too. I am going to play with ways to attach the masks to holding-sticks and/or ways to wear them. I'll post the results of my new masks as soon as I get them made. Thank you so much for your interest in my masks! The mask and 21 additional eye/feathers, ready for decorating. Torn .... I want to keep something I made for someone else! What do you do when you make something for someone else and then you like it so much that you want to keep it? OK! Yes, I do know the real answer - if you make something for someone else --- you have to let them have it!! Why is this an issue for me right now? Well, I have no less than 8 globes that I am slowly turning into lampshades and bowls. While I love the ones I have already made, I really do like some of the new ones even better! I'm making them to sell on Etsy and Ebay. Thankfully, I still can choose which one(s) get sold and which one(s) I keep... but I find that I love them all for different reasons - and they aren't even made yet! Oh what to do?? (I'm guessing that I will probably keep the globes that show more wear and tear, and sell the nicer ones... but it sure is tempting to keep the older, more unique ones! I have to laugh because one of my friends is having a similar dilemma. 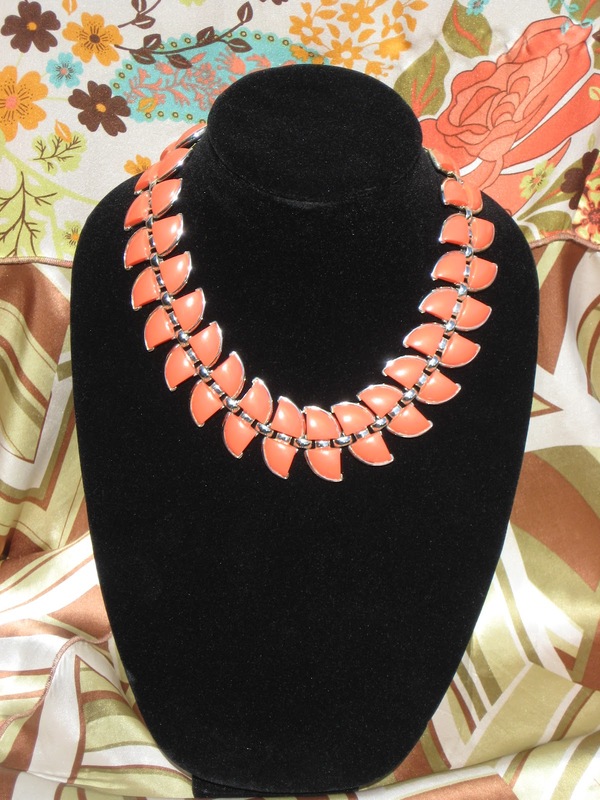 She has been looking for vintage jewelry to sell on Ebay or Etsy and has managed to find several really nice items (for example take a look at her "1960's Statement Necklace" listed on her blog www.10redpapayas.com). She says she doesn't know what to do because she has "bonded" with it. I don't blame her, it's fabulous!! I guess I'm fortunate because I have been able to find globes on a semi-regular basis and since they are (or were) wide-produced, there will probably be globes to choose from in the future. She isn't quite as lucky - the jewelry she's finding is pretty rare and she knows that if she sells it, she will probably not see another one like it. The blue world-globe lampshade sold today and I'm thrilled it's heading off to a new home! I have also created a new globe lampshade (this time, I used a tan/brown globe to make the lampshade). My other blog (http://re-coveredtreasures.blogspot.com) has more information and pictures. ** Soon I will be moving this blog over to my Re-Covered Treasures blog since it is somewhat redundant to have 2 blogs for what is essentially one company. Thank you so much for reading this blog and I hope you will continue to read my posts on my re-coveredtreasures blog! I am thrilled to have sold another lampshade. The one that sold was in a blue-color theme, with silver trim and clear/crystalline beading (it is very similar to the ones I have in my house). Happily, I have just finished working on a new lampshade to sell. This time I used a brown-colored globe to create the lampshade. For this lampshade, I cut the globe in half along the equator. Added gold metallic paint to the cut edge (to seal the edge and give it a more finished look). Then I glued on a thin dark-gold trim to the outer surface of the cut-edge (which also adds to a more finished look). I made sure that the original disk from the top of the globe (which come on most globes and indicate time line divination's) was glued on to the top of the globe. I finished the lampshade by adding a beautiful string of beads to the inside surface of the cut edge. I've had the beading for a while and was hoping to find a globe to match it with - which I think this globe does perfectly!! I really love how the lampshade turned out!! The beading makes it look quite elegant (and I'm tempted to keep it for myself - but I don't really need another one in my house since I already have two of them!). Making these lampshades is a lot of fun and I just love how unique each one is. If you were wanting a globe lampshade in a different color or size, please shoot me an email and I will see if I can find a globe that would fit your needs (used world globes are becoming harder to find, so it is not always easy to match a specific color, but I will try!). So how do you make Easter more Eco-friendly? By re-using items from previous years of course!! When my daughter was a toddler, I bought a couple of bags of plastic eggs at the dollar store (I've never seen any at a garage sale or thrift store). Since then, we've used and used and used those eggs! Every year we put age-appropriate items in the eggs and hide them for her. Rain or shine they hold up - and best of all they don't rot (which is a problem with real eggs...as we found out when I was young and my dad ran over one with the lawnmower a month later - EW!). Has she noticed that the eggs are the same every year? Nope. At this point we're good for at least another year or two before she probably even realizes that the Easter Bunny didn't leave them (oh oh, I'd better make sure she doesn't read this blog!). We also re-use the "grass" in the baskets. In fact, we have quite a bit of "grass" that we've been given by friends and family and we have never had to buy any. Frankly I can't stand the stuff, but I can't bring myself to toss it out because it really can't be recycled. So, until I find a different use for it, it will continue to grace her Easter Basket. Other items we re-use are: window-clings, figurines, bunny-ear headbands, and banners. Many of which were also gotten at garage sales or are family heirlooms (recycling at it's best... quality items being handed down through generations). 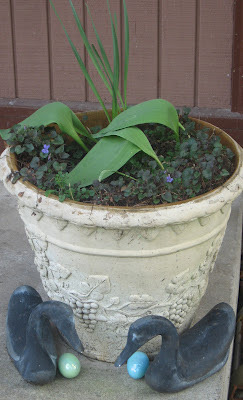 Baskets are another item we re-use. We have several favorites that we use over and over for Easter (and other gift-giving occasions). All of my baskets are finds at garage sales (and believe me, there are a LOT of great baskets available at garage sales for GREAT prices!! Thrift stores are another good source for inexpensive baskets. When buying used baskets, you do want to make sure that they are strongly constructed and don't have any lose or broken parts (unless you are good at repairing them). We even look for Easter dresses at thrift stores since fancy dresses are not usually worn more than a few times before they are donated... and we have found some lovely dresses there over the years. I will admit that the one thing we do buy new is candy. Each year we get a nice variety of decent-quality chocolates (and they are usually chocolates that her father and I might want to "help" her eat!). But overall, our financial outlay for Easter and our ecological impact are pretty low. The only real issue we have with holiday recycling and re-using items is storage. I have to admit that storage can be a real challenge... but it's worth it. Not only do most of the items we use save us money and help out the environment, but most of the items bring a real smile of joy to all of our faces as we bring out beloved items which hold many cherished memories - and that's really what Easter and other family holidays are about - making memories. My daughter has a dress that she and I both LOVED. Unfortunately, she has grown out of it (it's too tight across the shoulders and chest). What to do?? It has such a fun pattern and in such a fun set of colors. I could have given it to one of her cousins or friends, or I could have donated it to Goodwill or some other non-profit (and I usually choose one of those options). This time though, I decided that it was just too beloved to part with. This dress just happens to be easy to change into a skirt. It literally was just a matter of cutting the dress off at the armpits. I then simply rolled the cut-edge twice (towards the inside of the garment). Then quickly sewed a the newly-formed hem. Ta-daaa....... instant skirt! So cute and now she can wear it for another couple of years. Now I just need to figure out if I can find a use for the top. I would have made it into a shrug for her, except it's too small (darn!). This turned out so well that I'm thinking about doing a similar treatment to another dress that is too small for her (which is why my sewing pile just keeps getting bigger and bigger). My daughter wanted to re-do her bedroom. She had a lovely daybed (which I found at a 2nd hand store) but she wanted (begged for actually) a bunk bed so she could have friends spend the night (and I thought it was a swell idea because right now when she has friends stay overnight, they invade my living room forcing me to vacate to my bedroom for my own sanity's sake). We found a nice bunk bed on Craigslist (love them!). Her bedroom is pretty small and this bunk bed has a futon/sofa on the bottom that converts to a full-size bed when she has sleepovers. We love it because it provides her with a place to sit and relax but didn't require any additional floorspace. I also found a brown desk hutch on the side of the road one day and brought it home. I painted it white to match her desk (which was my grandmother's vanity that I also painted white). I did acquiesce to buying a couple of new items deemed "critical" by her (including some bedding and a couple of zebra-striped accessories), but most of her "decorations" were things that I found at garage sales or thrift shops and either repainted or re-purposed to work with her new color scheme (which is violet-purples, bright raspberry pinks, and black&white zebra stripes --- all mixed in with Peace Signs). The rose garland above her closet was originally a VERY pale beigy-pink with brown/green leaves. I used acrylic paints mixed with water to refresh the colors - so the pinks really pop now and match her bedroom. The overall look of her room is not what I was originally hoping for (I was thinking black and white with pops of shocking pink - with a sort of french/feminine theme)... but she LOVES it and that's what is important. 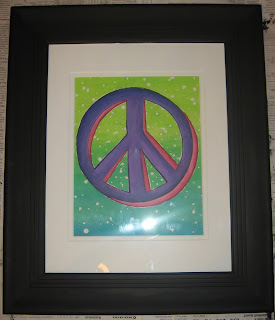 One of her favorite art pieces (and mine too) is the Peace Sign I painted with acrylic paints. I was originally just playing around with different painting techniques, but it ended up pretty nice-looking and matched her room pretty well - so we decided to frame it and put it up in her room. The frame is one I found at Goodwill - but it was originally a weird silver/gold color. I painted it my favorite flat-black and it looks awesome! I had to find a piece of glass to fit (and thankfully I had a old frame that was broken, so I salvaged the glass from it). And I even found white matting from another old frame. 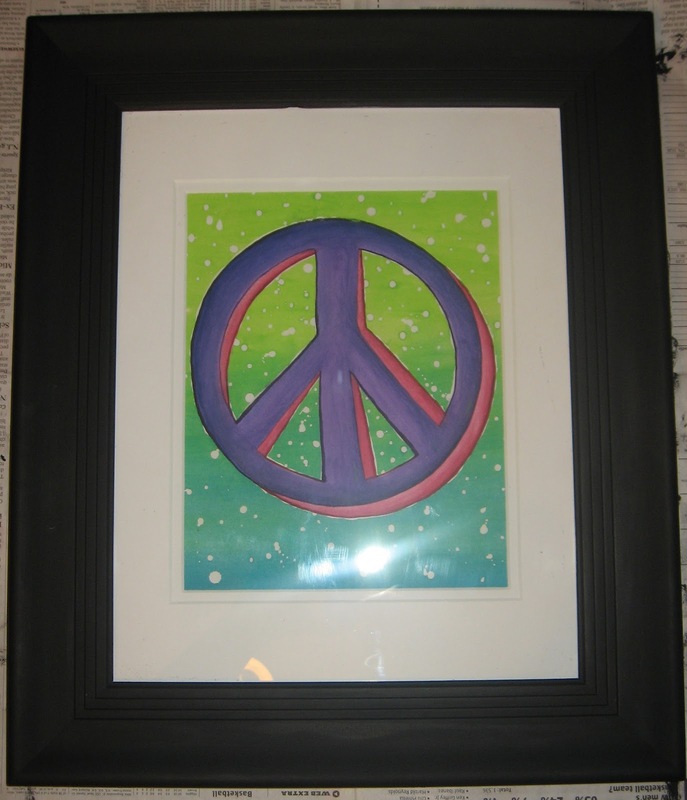 I think the overall final framed piece looks pretty good - and is a nice addition to her room. One of the final touches for her room is a door-hanging of plastic beads. I found it at a garage sale when she was a baby and decided that it was too dangerous to put up then. When I was going through stuff for her room, I found it buried in her closet - I pulled it out and taaa-daaa.... she loved it! There are still a few things I'd love to do (for instance I'd like to paint the dresser white) - but she's happy with the room as it is and since it's her room... I'm ok with that. Besides, I'm now onto other projects in the house. Hmmm... re-do the craft area or fireplace mantle? It's so hard to know what I should do next!